ColorPic is a free and simple utility with a single-minded focus: To help you grab colors from anywhere on your screen and assemble them into a palette you can use in your designs. It is fast--and free of banners and nag messages--but it takes a bit of fiddling to get it to play nice with Windows 7. ColorPic can collect multiple color swatches and sample more than one pixel at a time to produce average color values. ColorPic's window is divided into five collapsible sections: Palettes, Chips, Color, Mixer, and Magnify. The Palettes section lets you quickly switch between entire palettes, and comes prepopulated with some simple picks (Red WebSafe Shades and so on). The Chips section is where you can save individual hues, with a little color swatch for each hue. The Color section shows information about the currently selected color chip, including its Hex code (useful for working with CSS). The color mixer also shows information about the selected chip, including RGB and CMYK colors (somewhat confusingly named CMYB here). Finally, the magnifier section lets you see where your mouse is and increase the sampling dot size to three or five pixels, which then get averaged out. ColorPic is nice, but it feels dated: The included palettes all feature WebSafe colors, which haven't been relevant for years now. When installing it on Windows 7, it keeps trying to write to its program folder, something which is not possible with Windows 7's default permissions. Until you fix the permissions to make the folder user-writable, ColorPic will pop up an error every time you try to switch palettes, and will not close (you will have to manually kill the process). Vendor Iconico says this will be addressed in a future version of the application. Last but not least, if you lock the screen while sampling colors, ColorPic will pop up a different error requiring a restart. 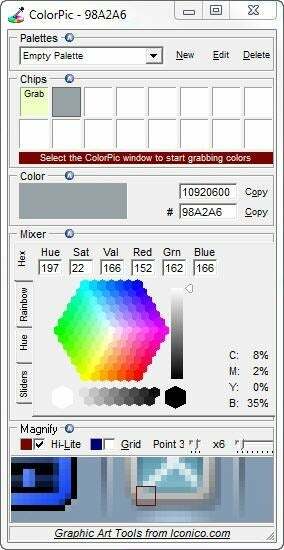 If you're willing to forgive its Windows 7 quirks (or are still using Windows XP or Vista), ColorPic is a very useful color picker. If, like me, most of your daily use consists of picking single colors, you might be able to forgive the quirks and enjoy the speedy utility behind them. Free and simple color picker ColorPic supports multiple swatches and Hex color codes.